Definition at line 222 of file BinaryStreamRef.h. Definition at line 103 of file BinaryStreamRef.cpp. Definition at line 106 of file BinaryStreamRef.cpp. Definition at line 111 of file BinaryStreamRef.cpp. Definition at line 130 of file BinaryStreamRef.cpp. References llvm::BinaryStreamRefBase< WritableBinaryStreamRef, WritableBinaryStream >::BorrowedImpl, and llvm::WritableBinaryStream::commit(). Conver this WritableBinaryStreamRef to a read-only BinaryStreamRef. Definition at line 125 of file BinaryStreamRef.cpp. References llvm::BinaryStreamRefBase< WritableBinaryStreamRef, WritableBinaryStream >::BorrowedImpl, llvm::BinaryStreamRefBase< WritableBinaryStreamRef, WritableBinaryStream >::Length, and llvm::BinaryStreamRefBase< WritableBinaryStreamRef, WritableBinaryStream >::ViewOffset. Given an Offset into this WritableBinaryStreamRef and some input data, writes the data to the underlying stream. a success error code if the data could fit within the underlying stream at the specified location and the implementation could write the data, and an appropriate error code otherwise. Definition at line 117 of file BinaryStreamRef.cpp. 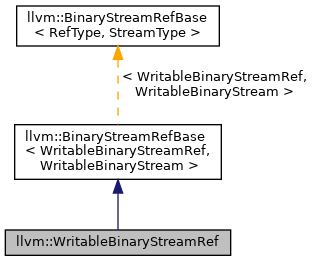 References llvm::BinaryStreamRefBase< WritableBinaryStreamRef, WritableBinaryStream >::BorrowedImpl, llvm::ArrayRef< T >::size(), llvm::BinaryStreamRefBase< WritableBinaryStreamRef, WritableBinaryStream >::ViewOffset, and llvm::WritableBinaryStream::writeBytes(). Referenced by llvm::BinaryStreamWriter::writeBytes(), and llvm::msf::WritableMappedBlockStream::writeBytes().